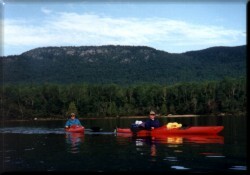 The Bow Trip, outside of Jackman, is one of the most well known multi-day paddle trips in the State of Maine. It affords the paddler a place to experience the quiet beauty of the woods in Northwestern Maine. 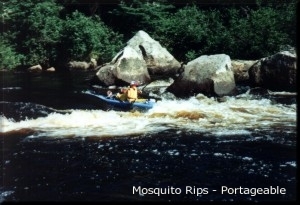 Wildlife abounds in the region and it's called the Moose River for good reason. From scenic, island-studded ponds like Attean and Holeb to short, fun-filled Class I and II rapids, the trip offers something for all paddlers. For the faint of heart, all the rapids on this trip are easily portaged. The "Bow" trip is our most popular guided trip. 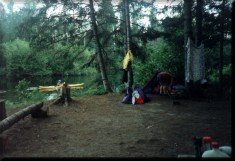 The trip begins on Holeb Pond and travels the next two days on the Moose River, the 3rd day brings us onto Attean Pond, one of the most beautiful ponds in the area, which is scattered with islands and sandy beaches. On all of our guided trips, the food and the paddling are great! We strive to give you the best experience possible. Kayak and canoe tours are enjoyed by people of all ages and abilities. Cry of the Loon encourages those with little experience to try something new and come to the wilderness. Try some hiking after a light morning paddle. Wildlife viewing is something we always do on trips. Kids are always welcome as long as they like to eat and swim! Our family-oriented trips take groups onto the scenic ponds in the region for paddling and fun. Beautiful sandy beaches during the day and cozy campfires at night make wonderful vacations for anyone. Paddle with us and find your slice of fun and adventure.